The QuantiFERON TB blood test is a special blood test that checks for prior exposure to tuberculosis. This FDA-approved TB test is frequently used for tuberculosis screening as an alternative to the TB skin test (PPD test). What is a QuantiFERON TB test? The QuantiFERON TB blood test, also known as a QuantiFERON Gold test and IGRA test, is an FDA-approved blood test that screens for prior exposure to tuberculosis. Why is this QuantiFERON TB blood test important? This tuberculosis blood test is an alternative to the TB skin test for people who need screening for tuberculosis for their school or work, including vendor credentialing. This QuantiFERON TB Test is a blood test. It typically takes 6 business days or less. The QuantiFERON Gold test, also known as a TB blood test, QuantiFERON test, QFT test and IGRA test, is a blood test that screens for tuberculosis (TB). The QuantiFERON test was created to help identify people who have been exposed to a bacteria that causes tuberculosis known as Mycobacterium tuberculosis, or M. tuberculosis. The QuantiFERON TB test is similar to the T-spot test. Tuberculosis is an infectious disease caused by M. tuberculosis that has been part of human history for a long time. M. tuberculosis usually infects the lungs but can also infect other parts of the body. Tuberculosis is very contagious, spreading from person to person from infected droplets. People who have been exposed to TB may or may not have symptoms. When symptoms of tuberculosis are present (i.e. "active" tuberculosis), they classically consist of coughing with blood-tinged sputum, weight loss and night sweats. However, many people who have been exposed to tuberculosis do not have symptoms (i.e. "latent" tuberculosis). Screening for latent tuberculosis is important because it can turn into active tuberculosis at a later date. This is why ongoing tuberculosis screening - particularly in people like healthcare and school workers and students who are at a higher risk of tuberculosis exposure - is so important for protecting communities. The good thing about TB blood testing is that it is quite accurate in identifying people who have been exposed to tuberculosis. The QuantiFERON TB test is one of a larger class of blood tests known as IGRA, or interferon-gamma release assay, tests. The QuantiFERON TB blood test, and IGRA tests in general, work by measuring how reactive one's immune system is when exposed to components of the tuberculosis bacteria. When triggered a certain way, the white blood cells in the body will release a special chemical called interferon-gamma that can be measured through the TB blood test. People who have been exposed to M. tuberculosis in the past will typically show high levels of interferon-gamma. In contrast, relatively healthy people who have not been exposed to tuberculosis will have low levels of interferon-gamma. Often requested with titer tests such as the hepatitis B titer, MMR titer and varicella titer and occasionally with the 10 panel urine drug test, the QuantiFERON Gold TB blood test will likely establish itself as the gold standard for tuberculosis screening in the years to come. Technically speaking, the QuantiFERON TB test engages the body's cell-mediated immune response in reference to proteins related to tuberculosis bacteria - mycobacterial proteins ESAT-6, CFP-10 and TB 7.7. One reason the use of these specific proteins in the TB testing process is valuable is because it enables this TB blood test to check whether someone who has received the Bacillus Calmette–Guerin (BCG) TB vaccine in the past has actually been exposed to tuberculosis or not (see below). Traditionally, TB screening has been done through a TB skin test, also known as a PPD test or a Mantoux test. To get a TB skin test, one needs to visit a medical office and receive a small injection of a substance known as a protein purified derivative (PPD) in the forearm. After 48-96 hours, the forearm needs to be checked and measured by a medical provider to see if any swelling, or induration, has developed at the site of the injection. If a raised swelling above a certain size is noted on the second visit, a chest x-ray is required to make sure that tuberculosis is not present in the lungs. As a result, the TB skin test requires a minimum of two visits and possibly more if the TB skin test is read as positive. As opposed to the TB skin test, the TB blood test is more convenient as it only requires one visit to a laboratory. During the lab visit, a simple, nearly painless blood draw is performed and the specimen is processed by the lab using specialized equipment. In contrast to the TB skin test, a second visit is not required for a TB blood test. And, because the QuantiFERON test uses sophisticated lab machinery instead of relying on manual skin measurements by a medical provider, this TB blood test is more accurate, particularly in borderline cases. What if I tested positive to a TB skin test previously? For people who have tested positive on a TB skin test, the QuantiFERON Gold TB blood test is a good choice. Most people who have had a positive TB skin test in the past are required to get a chest x-ray to demonstrate that active tuberculosis is not present in the lungs. The TB blood test, on the other hand, can often differentiate between a false positive and a false negative skin test without the need for a chest x-ray. As discussed previously, the QuantiFERON Gold TB blood test is more accurate and is the preferred option in anyone who has had the BCG vaccine. The BCG vaccine is a tuberculosis vaccine that is routinely given to people who are born in foreign countries in which TB is prevalent. People who have had the BCG vaccine previously will almost always test positive on the TB skin test, whether or not they have actually been exposed to tuberculosis. The BCG vaccine results in a "false positive" test because the BCG vaccine causes cross-reactivity with components of the TB skin test. Because of frequent false positive results, people who have had the BCG vaccine almost always need to get a chest x-ray to prove they are free of tuberculosis, resulting in excessive and unnecessary radiation exposure. Fortunately, QuantiFERON TB blood test results are not affected by prior BCG vaccination which makes it a good test for anyone who has received the BCG immunization in the past. The QuantiFERON TB test has demonstrated improved accuracy in regards to statistical test specificity relative to the skin test. More specifically, the QuantiFERON-TB blood test is reported to have a specificity of greater than 99% versus as low as 59% for the TB skin test. This increased QuantiFERON test accuracy is partially due to the fact that QuantiFERON blood testing results are not subject to interpretation error or bias from the medical provider reading the PPD test. The TB skin test, on the other hand, requires the person interpreting the test to accurately measure the size of swelling, or induration, on the patient and even one millimeter can make the difference between a positive or negative for latent tuberculosis. In addition to its benefits in testing people who have received the BCG vaccine previously, the TB gold blood test is of value to anyone (e.g. a healthcare worker) who suspects they may have had a false positive TB skin test in the past. Infrequently, people will need to get something called a two-step tuberculosis test for compliance reasons. The two-step TB test was originally designed to check for evidence of tuberculosis activity in people who may have been infected with M. tuberculosis and have lost some ability to react to the skin test. During the two-step TB test, one needs to get two TB skin tests over the course of multiple weeks, requiring a lot of time and multiple office visits. TB blood testing is a great alternative to the two-step TB test as it is not affected in the same way as the skin test by these "boosting" effects. In place of a two-step TB test requirement, the TB blood test still only requires one visit to draw the blood and process it. To summarize, there are specific circumstances in which the IGRA blood test is preferred over the TB skin test. As mentioned, the TB blood test is helpful for people who have received the BCG vaccination previously. People born outside of the United States typically fall into this demographic. The QuantiFERON Gold blood test is also helpful for healthcare workers who test positive on TB skin tests but have a history of negative chest x-rays. In these situations, the TB blood test can help avoid unnecessary annual radiation exposure from a TB x-ray. Generally speaking, the CDC now recommends that the IGRA test can be used as an alternative to the tuberculosis skin test for screening purposes. Like all tests, there are some disadvantages to note with the TB blood test. The QuantiFERON TB blood test does require whole blood for testing which might be of significance to a laboratory worker but is usually not of any meaningful significance to a patient. Because it assesses the white blood cell response, the QuantiFERON test does need to be processed within a specific timeframe after the blood draw for the results to be valid, making it more difficult to perform in some rural areas where the appropriate TB testing equipment is not available. And, because of its specimen testing requirements, the TB blood test also needs to be performed at a standard lab location as opposed to one in a remote area with limited equipment. Additionally, the accuracy of this test is not well-known when performed on young children or pregnant women or in people who have impaired immune systems from conditions such as AIDS. The TB blood test is also not well-researched in people who are on immunosuppressive treatments like steroids or chemotherapy. In these situations, it is possible that the immune system is too compromised to generate the immune response necessary to get an accurate QuantiFERON Gold result. If you need to get the QuantiFERON Gold TB blood test near you, you likely have some nearby options available. Most standard lab locations are able to perform the QFT test. To get a TB blood test, you will need to go to the lab and the lab staff will draw several vials of blood (typically a Nil tube, TB Antigen tube and a Mitogen tube) from you. After collection, the whole blood sample will be incubated for a period of time (no special isolation, washing or culturing required) and the QuantiFERON results will be ready after that. 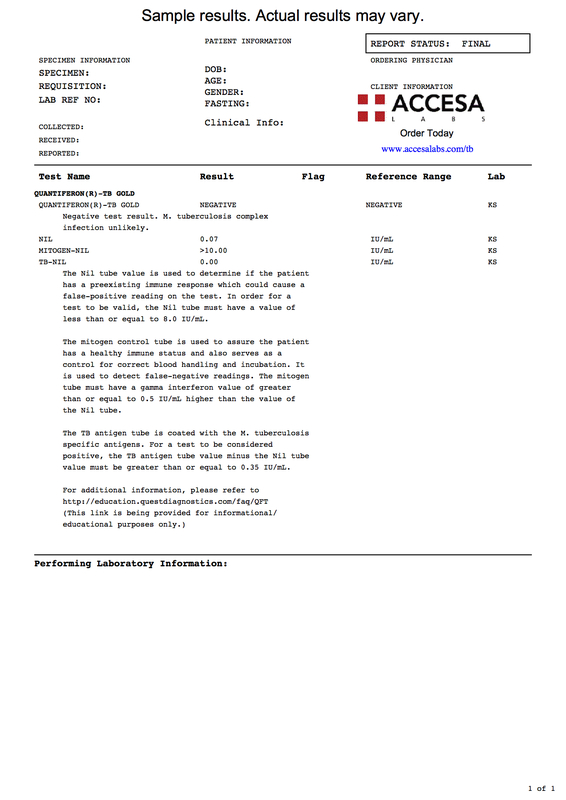 If you click on the sample results link above, you can see what a QuantiFERON-TB Gold test lab report looks like. In this particular sample lab report, the QuantiFERON test results say negative which indicates a negative results. The numbers reported next to the Nil, Mitogen-Nil and TB-Nil rows indicated that the controls for the test (the additional vials of blood) were successfully performed as a comparison to the actual blood test. More specifically, the Nil vial checks for possible false positives, the mitogen control helps check for false negatives and the TB antigen tube helps with the patient's sample. Conservatively, QuantiFERON TB blood test results typically take approximately six business days to be reported. For many people in busy metropolitan areas, TB blood test results can be available in as soon as three business days. A negative QuantiFERON lab report, when accurate, is the best result. It indicates that evidence of tuberculosis exposure cannot be found in the blood specimen. A negative lab test is similar to a negative TB skin test and, in most cases, does not require a chest x-ray for confirmation or other diagnostic studies. What does a TB blood test result mean? Positive or indeterminate QuantiFERON TB blood test results typically mean that you will need to get a chest x-ray to confirm that you do not have active tuberculosis. Negative QuantiFERON Gold results imply that you do not have latent tuberculosis at the time the blood was drawn. If you are wondering how long your QuantiFERON TB blood test result is good for, the answer is it really depends on who is asking for it. Broadly speaking, many organizations recommend annual TB blood testing for screening. That being said, every organization has its own recommended guidelines as far as how often one needs to be screened for tuberculosis. Tuberculosis screening guidelines have been created in consideration of the risk of possible TB exposure in the work or school environment. The best way to know for sure when you need to get another QuantiFERON TB test is to ask the person or organization requiring the test to see what their requirements are. If you are simply getting tested for your own reasons, then retesting can be performed at any time and based on one's comfort level. After all, someone who has a negative TB blood test result but is exposed to tuberculosis the very next day will have a positive result on a future retest. Why is routine tuberculosis screening performed and why it is so important? Tuberculosis testing is performed because, when tuberculosis is active, it is a highly contagious disease that is easily communicated through droplet exposure. If a person infected with tuberculosis enters a community like a school or workplace that requires close contact with a diverse group of people, there is a much higher likelihood that other people will be exposed to tuberculosis from the infected individual. Given these community risks, tuberculosis is thought of as a public health issue and active efforts are made to minimize the spread of tuberculosis when it does occur. Tuberculosis testing conveys one's TB health status at a point in time and regular testing is performed to ensure that people in schools and workplaces are safe when possible exposures to tuberculosis may occur on an ongoing basis. Because the QuantiFERON TB blood test is a relatively new test, it is only now becoming widely adopted within the traditional medical community. As such, facilities, organizations and companies that previously only accepted TB skin test results are now embracing the QuantiFERON test as a useful alternative for healthcare and educational workers. The QuantiFERON-TB IGRA test is made by a company called Qiagen and, with over 30 million tests performed to date, is increasingly becoming the gold standard for tuberculosis testing. Approved by the Food and Drug Administration (FDA), in the United States, the QFT test is now used in more than 130 countries and has over 1000 clinical and scientific studies supporting its use. Although people in the United States are relatively insulated from the prevalence and implications of tuberculosis, the CDC has some startling statistics on the disease. According to them, one third of the world's population is infected with tuberculosis and there were almost two million deaths from TB worldwide in 2015. In the US, approximately three cases per 100,000 persons have occurred over the past several decades. These numbers have remained fairly stable and, fortunately, active TB surveillance programs exist at all levels of government in an effort to protect the public should a new case be discovered. In the US - and in most parts of the world - people who are at higher risk for getting TB are people with HIV, babies and children, and the elderly. Additionally, people with weakened immune systems from chronic medical conditions, people who inject illegal drugs and people in correctional facilities may also be at a greater risk. To improve awareness of TB worldwide, World Tuberculosis Day, or World TB Day, is observed on March 24 of each year. Sponsored by the WHO, World Tuberculosis Day was started in the early 1980s and, each year, organizes around a new theme in an effort to rally participants in the fight against tuberculosis. We hope you found this TB blood test lab review helpful. QuantiFERON Gold TB Blood Test at Guaranteed Prices.